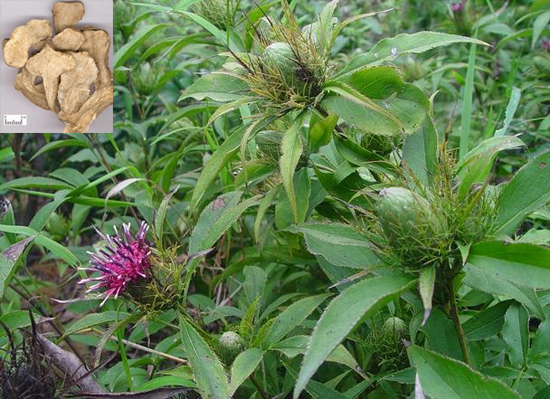 Botanical Name: Atractylodes macrocephala Koidz. (Fam. Asteracae). Common Name: White atractylodes rhizome. Part Used & Method for Pharmaceutical Preparations: The rhizomes are dug in October, cleaned and dried in the sun or baked. They are then soaked in water and cut into slices. 1. Weakness of the spleen in transportation and transformation of water manifested as poor appetite, loose stool, lassitude and epigastric and abdominal distension and fullness. White atractylodes (Baizhu) is used with Ginseng (Renshen) and Poria (Fuling) in the formula Sijunzi Tang. 2. Qi stagnation due to weakness of the spleen and stomach manifested as epigastric and abdominal fullness. White atractylodes (Baizhu) is used with Immature bitter orange (Zhishi) in the formula Zhi Zhu Wan. 3. Deficiency and cold in the spleen and stomach manifested as cold sensation and pain in the epigastric and abdominal regions, diarrhea and vomiting. White atractylodes (Baizhu) is used with Dried ginger (Ganjiang) and Ginseng (Renshen) in the formula Lizhong Wan. 4. Internal accumulation of water and dampness due to dysfunction of the spleen and stomach accompanied by edema or phlegm-fluid syndrome: a) for edema and ascites, White atractylodes (Baizhu) is used with Areca nut shell (Dafupi) and Poria (Fuling); b) for phlegm-damp syndrome manifested as palpitation, asthma, cough with excessive sputum and stifling sensation in the chest, White atractylodes (Baizhu) is used with Cinnamon twigs (Guizhi) and Poria (Fuling) in the formula Ling Gui Zhu Gan Tang. 5. Spontaneous sweating due to qi deficiency. White atractylodes (Baizhu) is used with Astragalus root (Huangqi) and Ledebouriella (Fangfeng) in the formula Yupingfeng San. 6. Restlessness of fetus due to weakness of qi of the spleen during pregnancy: a) if accompanying manifestations include vaginal bleeding and pain in the lower abdomen, White atractylodes (Baizhu) is used with Ginseng (Renshen) and Poria (Fuling); b) if accompanying manifestations include dizziness, vertigo and palpitations, White atractylodes (Baizhu) is used with Prepared rehmannia root (Shudihuang), White peony root (Baishao), Chinese angelica root (Danggui) and Donkey hide gelatin (Ejiao); c) if accompanying manifestations include soreness and pain of the lumbar region due to deficiency of the kidneys, White atractylodes (Baizhu) is used with Eucommia bark (Duzhong), Teasel root (Xuduan) and Mulberry mistletoe (Sangjisheng); d) if accompanying manifestations include distention and fullness in the chest and abdominal region due to qi stagnation, White atractylodes (Baizhu) is used with Perilla stem (Sugeng) and Amomum fruit (Sharen); e) if accompanying manifestations include red tongue proper with yellow coating and rapid pulse due to internal heat, White atractylodes (Baizhu) is used with Scutellaria root (Huangqin). Dosage: 5-15 g, used unprepared for drying Dampness, stirbaked for Qi and Spleen tonification, and stir-baked with earth or baked to brown for strengthening the Spleen to stop diarrhea. Cautions & Contraindications: The raw herb is used for resolving dampness and promoting water metabolism. The fried herb is used for replenishing qi and strengthening the spleen. The carbonized herb is used for tonifying the spleen and stopping diarrhea. White atractylodes (Baizhu) is contraindicated in cases with thirst accompanied by exhaustion of body fluids.